This Irish fishermans crew neck sweater is knitted using the traditional rib stitch. The rib is knitted using a large stitch pattern, making this garment exceptionally warm - a must have for the cold winter months! Traditionally, this style of garment would be worn by fishermen on the rough seas to keep warm, hence the name! 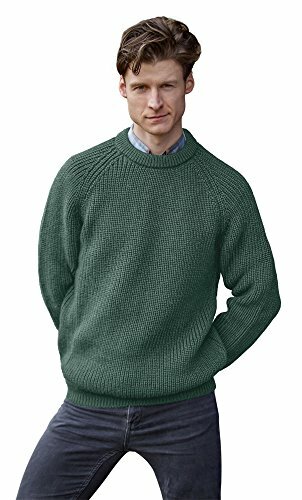 This Irish fishermans crew neck sweater is made from 100% Pure Wool for Warmth. This sweater is created by Westend Knitwear. Located in the village of Monasterevin in County Kildare, West End Knitwear was established by Molly Cullen in 1957. Molly's dream was to incorporate the family knitting business whose heritage stretched back for over 100 years. Molly is the granddaughter of Kate O'Shea, who, in 1856, was the first craftswoman in Ireland to commercially market her robust, hand knitted woolens. Molly's sons John and Paul along with her grandson Niall are the present owners of the company. Outstanding Quality & Design - A must have for any wardrobe.